Hey everyone! So the Atlanta Burlesque and Cabaret "meetup" group is officially down for good! Now, we have a facebook to supplement our escapades and announcements! There is still the old google group up for a while if for nothing else than to give an alternative to those who do not like face book (yes... they exist) and so that I have an easy forum to write out the weekly interest stories, but I think facebook is going to be my go-to for most of the instant messaging and bulletins for the in-between incidentals that happens. Its more user friendly and more importantly, Burlesque friendly ;) So check it out! I am currently having a logo made for the group because pictures just don't seem to cut it. -Page did a wonderful costuming presentation. If you are interested in doing a presentation at the meeting please let me know. It only has to be 15-30 minutes long and it can run the gambit of all things theatrical as long as you tie it in with Burlesque, cabaret and/or vaudeville. Look for more information on both of these things to come in the near future! - The decision to actually let the meetup fold, and create a Burlesque and Cabaret facebook group was made. The only difference is, you will want to be sure to keep up with the calendar on the Atlanta Burlesque Group here! You can keep up with the calendar, check out all of Atlanta's local talent and see reviews done on past shows. 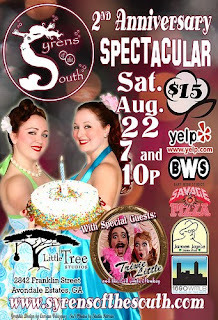 On to This Week in Atlanta Burlesque! Description: A sneak preview of the new movie The Goods with special guests Syrens of the South! Calling all Kinksters to Club Fetish! It's time to take a walk on the wild side of life. will be aired September 23, 2009 on the Travel Channel at 8 PM eastern time. watched program on Travel Channel's "Extreme" series!!! Look out for the Jeering Jon Carney, the Ruthless Renea' Le Roux, Cruel Katherine Lashe, The Tricky Talloolah Love, and the scintillating Spookey Le Strange! Hey! have you seen the new face of Pinup Girl Cosmetics? Check out their hot new logo action!!! Do you know about Pin up Girl Cosmetics? Not only do they have great makeup, but they take some really great pinup inspired photos and are doing some really great things in the scene! Their boutique also carries fashion lines of different designers in the city including the Fabulous House of Le Roux! Do you have what it takes to "Find the real you"!?! Effie's Club Follies has a show in Athens at New Earth Music Hall on Saturday August 15 as well. Sweet! Please remember if you send me a quick write up of the who what when and where, I will be sure to include it in all of the weekly announcements!